The battle of voice assistants with screens is on. 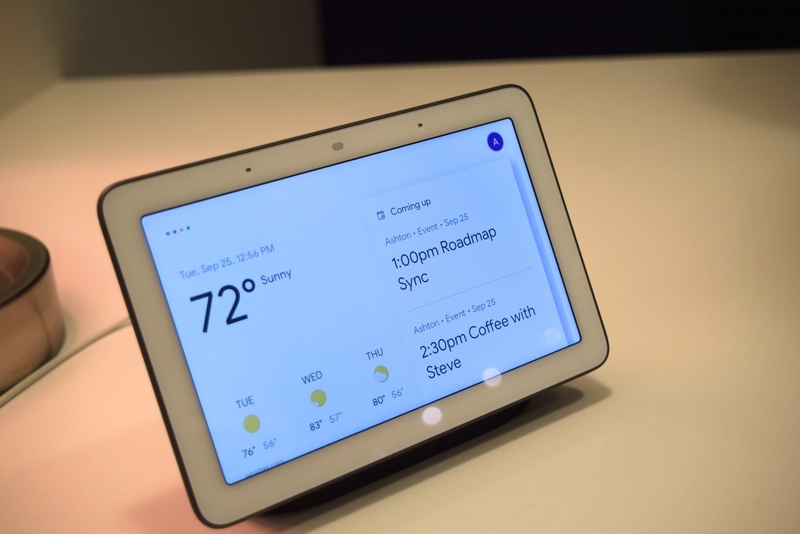 Just one day after Facebook launched its Alexa-powered video chat gadget Portal, and a few weeks after Amazon announced its second-generation Echo Show, today, Google is introducing Google Home Hub. Like its competition, the device is always listening for a voice prompt (“Hey, Google”), but, unlike them, it doesn’t have a camera. It’s a strategic move from Google given today’s environment. Some folks are worried about the privacy implications of putting an always-on, artificially intelligent voice assistant in their homes. Adding a camera heightens those concerns — so Google Home Hub appears to be a (slightly) less invasive option. It also means the device is much more about consuming information than creating it, especially when it comes to photography. The $150 gadget looks like a propped up tablet with a 7-inch touchscreen. Like the original Google Home, the Home Hub can tell you about your day’s schedule, control your smart lights, and offer the weather forecast — but it will also show you, with a friendly interface on its screen. The Google Home Hub’s always-listening microphone is activated with a “Hey, Google” or “OK, Google” prompt. A switch on the back disables the microphone during sensitive conversations. And the gadget includes capabilities that only an assistant with a display could do. A switch on the back of the Google Home Hub disables the device’s microphone. Among its strongest features is how it handles Google Photos. Google told BuzzFeed News that the device was, in part, the company’s attempt to recreate the digital photo frame for the modern era. “There was lots of demand for digital photo frames,” Google’s Rajat Paharia told BuzzFeed News, but they had lots of problems. (Frankly, they all sucked!) On Home Hub, Google tried to make the digital photo frame easier to use, keep it constantly fresh with new photos, and make the screen as indistinguishable from a framed photo as possible — which meant taming the screen brightness. Saying “show me photos of my family” turns the Home Hub into a digital photo frame with rotating images of friends or family members. To set it up, you select the faces you want to appear. Using Photos’ facial recognition, it then pulls fresh images of those people from your recent pictures and camera roll into a new kind of album in Google Photos called Live Albums, where photos of people you’ve tagged automatically show up. You can also share these albums so that, say, a grandparent could have new pictures of the grandkids show up automatically on their Home Hub. “Show me photos of my family” turns the Home Hub into a digital photo frame. It can also show you highlights from your recent photos — and while it’s partially based on the favorites you pick, it’s also notable due to what it excludes. It won’t show photos of things like receipts, documents, parking meters, hotel doors, or photos that are out of focus, for example. Google also says it removes any “sensitive content” from highlights so that there are “no surprises in the home.” BuzzFeed News confirmed that this meant it should not, for example, put your nudes on display in the living room. Finally, Google did a lot of work to make the display adjust automatically based on the ambient light to solve the bright glowing screen issue. A feature called Ambient EQ automatically adjusts both the screen brightness and color temperature in an attempt to make the photos on the display look like an actual framed photo. “It’s trying to mimic real-world physics on a digital display,” said Paharia. The Google Home Hub’s Ambient EQ feature. The Home Hub also works as a multimedia station. You can start watching HBO from your Home Hub in the kitchen and then beam it to a Chromecast-enabled TV in the living room. If you have a Nest video doorbell, the Home Hub will show a live feed of front-door footage. When it plays you the news, it can display Reuters TV’s daily digest or videos from other providers. Ask for the traffic to work, and the Home Hub will show a map overview of where the congestion is. Live footage from the Nest video doorbell, displayed on the Google Home Hub. Because Google owns YouTube, the Google Home Hub is, of course, deeply integrated with the user-uploaded video platform. A Google product manager demonstrated how “show me how to dice onions” prompted the Home Hub to stream “How to Dice Onions Like a BOSS CHEF” from the YouTube channel Chef and Steward automatically. However, even in the highly controlled confines of a press demo, YouTube, which has faced a number of issues including the propagation of exploitative videos and conspiracy theories, could not be contained. The query “Show me how to tie a tie” inadvertently surfaced a video titled “The Family-Friendly Noose Song,” with over 2.4 million views on the platform. 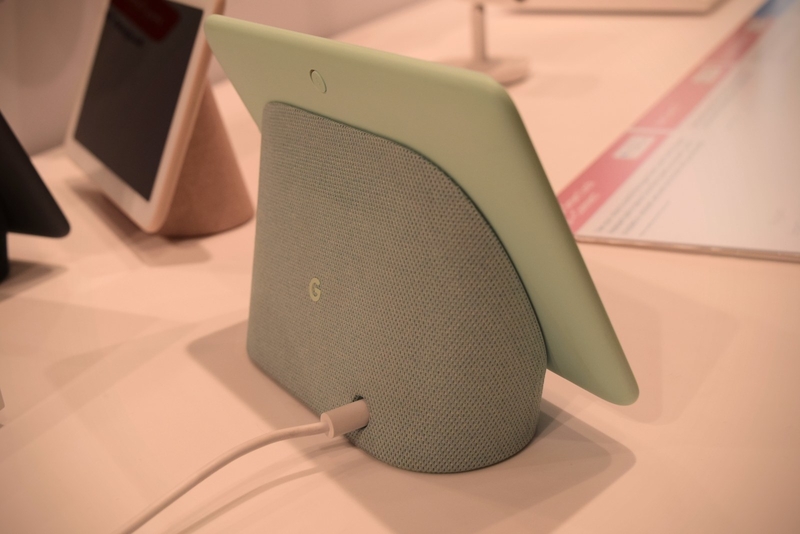 The Home Hub comes in four colors: Chalk (white), Aqua (green), Charcoal (dark gray), and Sand (pink). It can be preordered today, and ships on Oct. 22. Google Home Hub’s pink option is called Sand. An earlier version of this post misstated the name of the color.